Ominous and insistent midnight buzzing has been the far-too-consistent soundtrack at the last couple of campsites, as mozzies have done their best to drive our chewed carcasses further insane. The campsite near Ragusa, Scarabeo, was lovely in all respects bar one – the location was surrounded by intensive poly-tunnel fruit and veg growing, and the air was thick at certain times of day with flies. Not just flies, either – mixed in with them were little biting buggers of various types. The site was solid, mostly with Germans settling in for the winter, but some familiar vans and faces from previous sites. The “ACSI trail” is starting to become very predictable, as the route options become more limited – there’s a ring of campsites around the Sicilian coast, about half of which are in the discount card book everybody’s carrying. So, of course, all those going anti-clockwise are seeing each other at site after site. Ellie’s previous post mentioned that we’d met Neil and Jenny here again – once the half-joking accusations of stalking had died down, out came a corkscrew and a wooden spoon. Campsite cats were again out in force – this time, though, they weren’t ones that you’d give a cuddle lightly. They seemed to be earning their keep well, though – we found a pile of lightly gnawed innards (definitely rat – the tail was still present) in the grass just behind our pitch one morning. It was a good base for heading back to Ragusa, the hill town we’d passed through a couple of days previously. Since their van is somewhat less than manouverable and parkable, Neil and Jenny dived into the back seat of our van for the day. Ragusa was heavily rebuilt, as with many other towns in this corner of the island, after a massively destructive late 17th century earthquake. 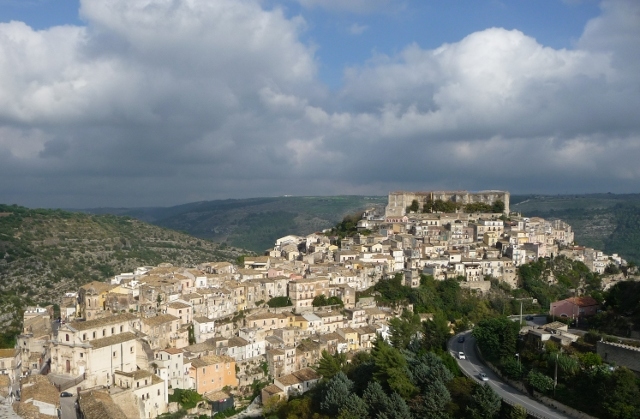 It split Ragusa clean in two, with a huge cleft between the halves, leaving one half a severely space-constrained hill town whilst the other opened out onto a plain. Needless to say, that half has grown and been developed in the interim, but the other half – Ragusa Ibla – has stayed a gem. 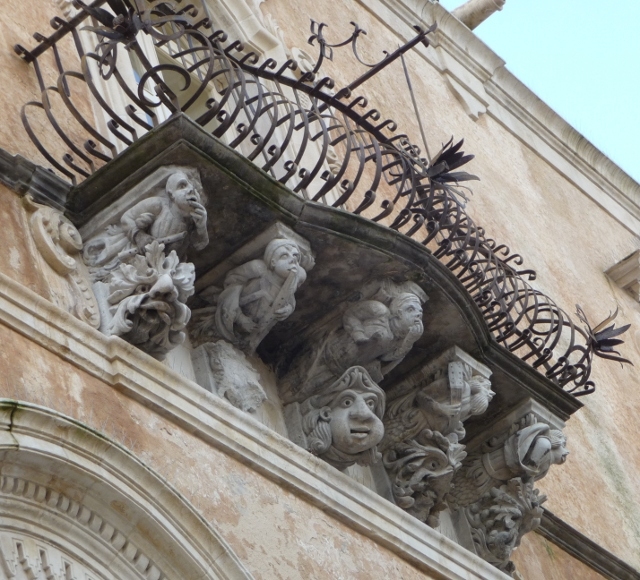 All steep streets and alleyways, the architectural consistency is amazing – just about everything is baroque. During brief bar breaks, Jenny also introduced us to a couple of traditional Sicilian dishes, favourites of hers from several years spent working in Italy – Arancini (deep-fried rice balls with a savoury centre) and Cannoli (pastry tubes filled with ricotta cheese and dusted with crushed Pistachios – grown on the slopes of Etna). A somewhat less successful daytrip was organised by the campsite themselves, with minibuses taking people in to a large market at nearby Vittoria. The day wasn’t exactly optimum, with the rain approaching horizontal on occasions, which probably contributed to the cheerless sight of a stream of vehicles (including stall trucks!) queueing to leave the market as we arrived. The relatively small food end of the market remained thriving, veggies piled high next to crates of escaping snails – but the rest was just a mix of plastic household rubbish and poor-quality tasteless clothing. Since Vittoria’s a modern town without much in the way of attractions, the two and a half hours until the minibus returned dragged slowly, even with the help of hiding in a nearby bar for some fortifying pastries. 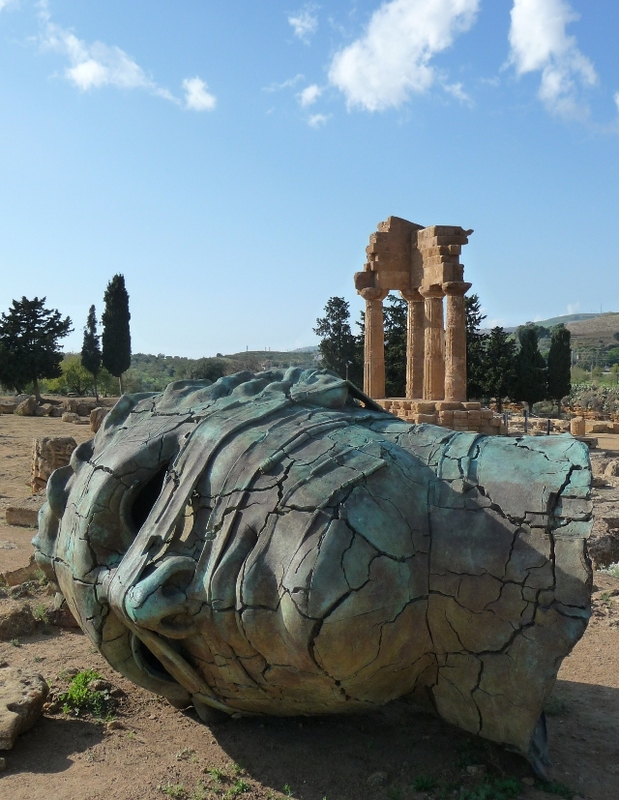 We headed inland for our next short leg – towards the reputed geographical centre of the island, Enna. We hunted through the narrow back streets of Caltagironi, a noted centre of ceramic production, for the staircase to one of the main churches – 140-odd steps each with a ceramic tiled riser of a different pattern. The hunt was in vain, but we might still have several items of laundry, liberated from some of the low overhanging balconies lining the narrow streets, trailing from the roof of the van… As the days are so short now the clocks have changed, we got to Piazza Armerina and started to hunt for an open agriturismo campsite. Eventually, we found it – only to find the gate firmly chained and padlocked. A “problem with the water”, allegedly. Shame, because it was in a stunning location in the rolling countryside on the edge of town. That gave us a dilemma, though – head on towards Enna towards a site that was rumoured to be open, but for which we had very few details, or head back to the coast towards one we knew existed and was open. We chose the coast. By the time we’d fought our way through the chaotic traffic of Gela, dominated by a huge petrochemical plant on the edge of town, and found the site night had fallen properly. So we just drove in, headed towards the first empty pitch – and watched as Neil and Jenny’s bemused heads poked out of the window of their van in the next pitch… They quickly recovered sufficiently to pass us a glass of red. After a mozzie-munched night, a second attempt at seeing Enna followed, again with extra passengers. Enna long had the reputation of being impregnable, but we couldn’t quite figure out why as we approached. Then the cloud lifted slightly to reveal the upper town, filling the top of a small rock high above the lower town, with a large Norman castle at one end. The main street was narrow, steep and packed solid – but we managed to find a fairly central parking space, and wandered up into the clouds. As we approached the Duomo, the top of the tower faded gently into misty white – so we continued upwards towards the castle and neighbouring “Rock of Ceres”. Fortunately, by the time we got there, the cloud had cleared and lifted – we stared from the tip of the rock across miles of lower countryside, with thunder and lightning visible and audible in the distance, seemingly far beneath us. From Enna, back to Piazza Armerina’s Roman Villa. 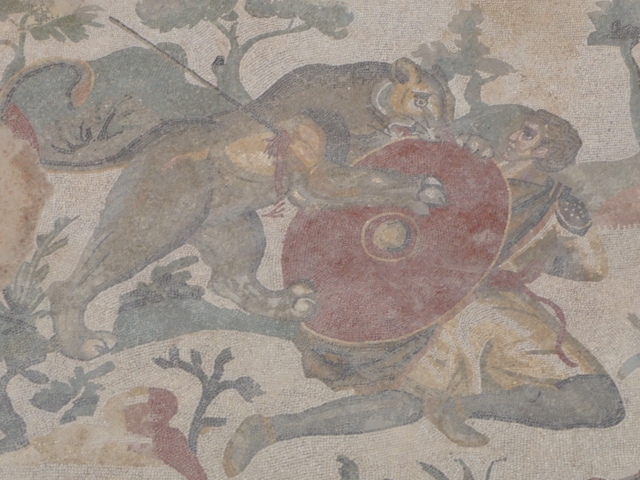 Famed for the mosaic floors, those we could see were truly superb – unfortunately, much of the extensive site was closed for preservation work, and the areas we could get to were severely curtailed. By the time we returned to the coast, it was once again pitch black – and starting to hammer down with rain. You’d think that that would stop the mozzies, wouldn’t you? We wish. 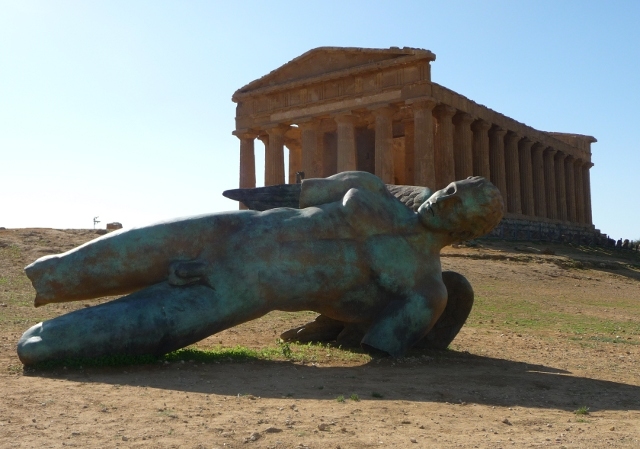 In the morning, though, blue skies and a warm sun greeted us, ready for heading to Agrigento, home of the Valle dei Templi – a ridge of hill outside the modern town, containing several Greek temples. One is superbly preserved, and almost complete. Others have a few columns erect, whilst the largest – one of the largest known from the whole Greek empire, albeit never finished – is nothing but a pile of rubble. The nearby museum gave us an idea of the epic scale of the temple of Olympian Zeus – well over 100m long, over 50m wide, and believed to have been more than 30m high, the roof was partially supported by 8m tall statues. One has been reassembled in the museum, together with a couple of surviving heads – to try to extrapolate from those to the whole building leaves you awe-struck. 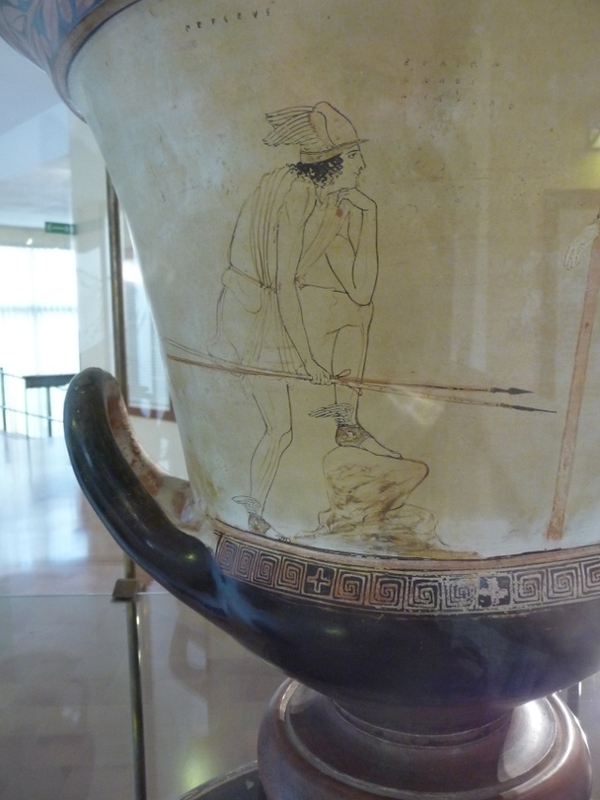 The museum’s extensive collection (every time you thought you must be about finished, there were a few more rooms round another corner) also contained a surprising number of incredibly well preserved large vases, beautifully decorated with scenes illustrating the great classic tales. The icing on the cake, though, lay with the frequently uneasy combination of classic architecture and modern art. Igor Mitoraj’s fragmentary bronze statues dotted around the ruins really added something. Days like this – perfect weather accompanying a wonderful visit to a fascinating site – are what makes us put up with the bites and the rain.